When words just aren't enough, sometimes a see-no-evil monkey says it all. But what if the emoji you really need just doesn't exist? We take a look at a campaign calling for a range of new phone icons. From smiley faces to aubergines and unicorns, there are now hundreds of emojis with which we can illustrate our phone messages. But as the popularity of these tiny pictures grow, for many there are some glaring omissions. Countries around the world are represented with mini flags, from Ascension Island and the United States to Djibouti and the United Kingdom. However England, Scotland and Wales are missing from that list. Now a campaign which would allow patriots in the home nations to wave virtual flags in their text messages is gathering momentum. And Unicode, the authority on computer text and characters has said the emoji flags for England, Scotland and Wales could be introduced to devices in 2017. Why are there no flag emojis for the home nations already? 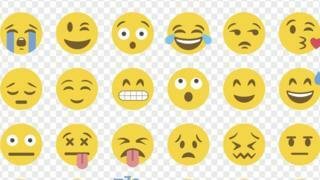 Jeremy Burge, the founder of Emoji-pedia, told BBC Radio Scotland that Unicode used the flags listed by the International Organisation for Standardisation (IS0). Speaking on the Good Morning Scotland programme, he said: "Unicode can't just come up with a list of which countries to support. "They look at ISO... and it has a list of country flags and under that the UK is listed, and Scotland is listed under the UK. "Unicode doesn't currently support the next tier of flags." Who is leading the campaign for the emoji flags? Mr Burge and BBC Wales' head of social media Owen Williams submitted a proposal for a new range of flags to Unicode. It came after Scotland's former first minister Alex Salmond wrote to Unicode with a similar request. Mr Burge said: "I saw that Alex Salmond said he wrote to Unicode about this last year but what he didn't do, he didn't put in a formal proposal so that's what I did to make this happen." He added: "A lot of the argument came down to the Commonwealth Games. "There would be lists on Twitter where you'd see all the flags of every country and scores and medals and then Scotland couldn't be represented. "There was no way to put the flag there. So it seemed a really big omission that [Scotland] was competing as a country on an international level but we didn't have a way to represent that like all the other countries." It could be some time before home nations flags come as standard on smart phones, according to Mr Burge. "It's more complicated than it looks," he said. "People think that you might just be sending a picture from a phone to a phone but actually all the major phone companies need to agree on what the emojis are before they can work on any phones." He said their proposal has not yet been approved but Unicode have asked for public feedback on the plans. "The best case scenario for Scotland is that Unicode will say absolutely we are allowing this tier of flags," said Mr Burge. "Then it's over to Apple and Google - the major tech companies - do they want to put these flags on? "That's the next step so we've still got one more hurdle to cross to get this happening." Are there any other new emojis in the pipeline? Avocadoes, kebabs and kiwis were the latest icons to be given to the nod by Unicode earlier this year. The list of 71 new emojis approved by the organisation also included croissants, a boxing glove and a black heart. But Mr Burge is considering another proposal - a takeaway coffee cup. "I know we already have a coffee mug... but I think the takeaway cup has different connotations," he said.